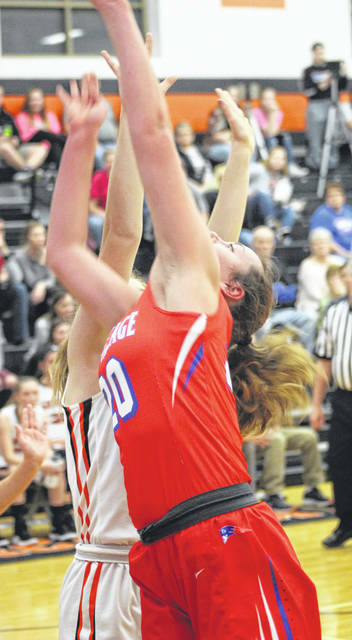 Tri-Village senior Emma Printz puts up a shot against Arcanum’s Camille Pohl during their Cross County Conference game on Thursday night. The Patriots won the game, 57-45. 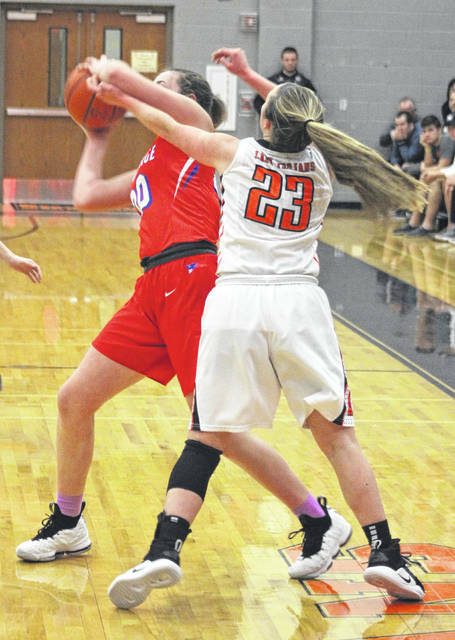 Arcanum junior Camille Pohl battles for a rebound with Tri-Village’s Maddie Downing during their Cross County Conference game on Thursday night. The Patriots won the game, 57-45. 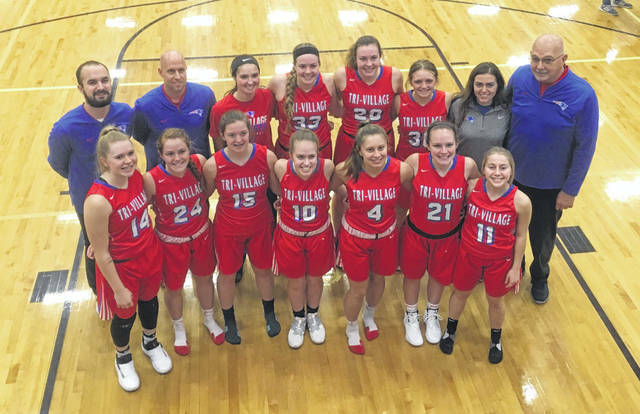 With their victory over host Arcanum on Thursday night, the Tri-Village Lady Patriots completed the 2018-19 season as Cross County Conference champions with a perfect 12-0 record in conference play. Tri-Village junior Andi Bietry looks to pass the ball down low to a teammate during a Cross County Conference game at Arcanum on Thursday night. The Patriots won the game, 57-45. 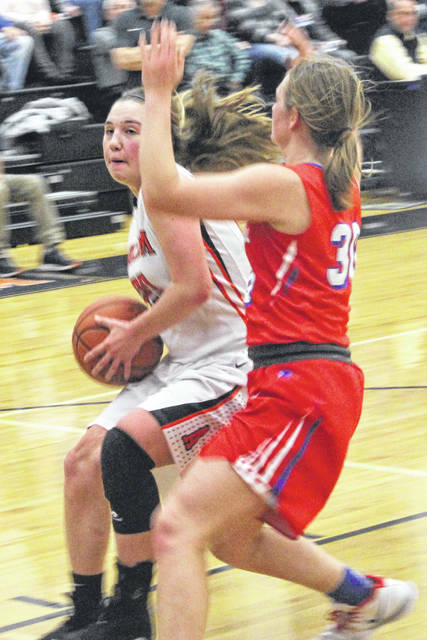 Arcanum’s Gracie Garno (23) plays some tight defense on Tri-Village’s Meghan Downing during their Cross County Conference game on Thursday night. The Patriots won the game, 57-45. 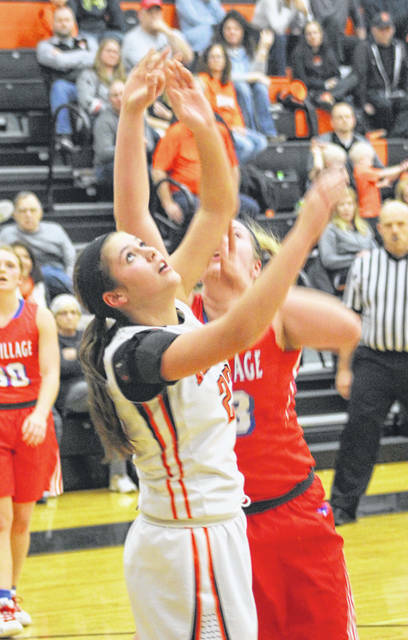 Arcanum freshman Hailey Unger pulls up for a mid-range jump shot during a Cross County Conference game against Tri-Village on Thursday night. The Patriots won the game, 57-45. Arcanum junior Kayla O’Daniel shoots a 3-pointer from the wing during a Cross County Conference game against Tri-Village on Thursday night. The Patriots won the game, 57-45. Tri-Village junior Lissa Siler weaves her way through several Arcanum defenders during their Cross County Conference game on Thursday night. The Patriots won the game, 57-45. 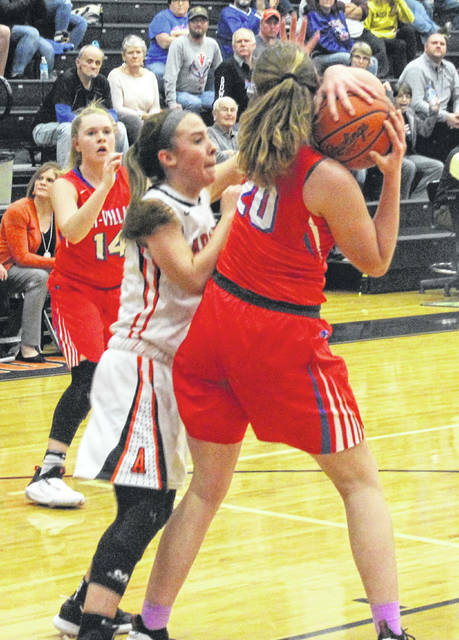 Tri-Village’s Maddie Downing puts up a shot with Arcanum’s Camille Pohl tightly guarding her during their Cross County Conference game on Thursday night. The Patriots won the game, 57-45. 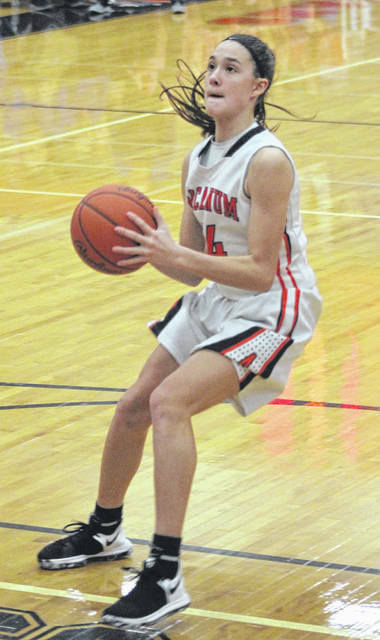 Arcanum freshman Madelyn Fearon looks for an open lane to drive toward the basket during a Cross County Conference game against Tri-Village on Thursday night. The Patriots won the game, 57-45. Tri-Village’s Meghan Downing goes up strong to the basket during a Cross County Conference game against Tri-Village on Thursday night. The Patriots won the game, 57-45. 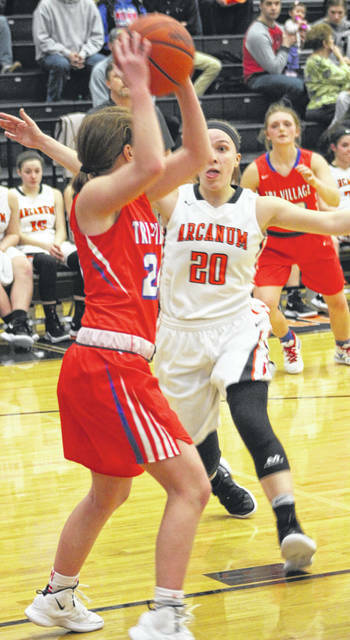 ARCANUM – If you didn’t know any better, you would have thought the Tri-Village and Arcanum girls basketball teams were battling for a league championship on Thursday night. In reality, the Patriots wrapped up the Cross County Conference title several games ago, but needed a win over the host Trojans to complete a perfect season in league play. 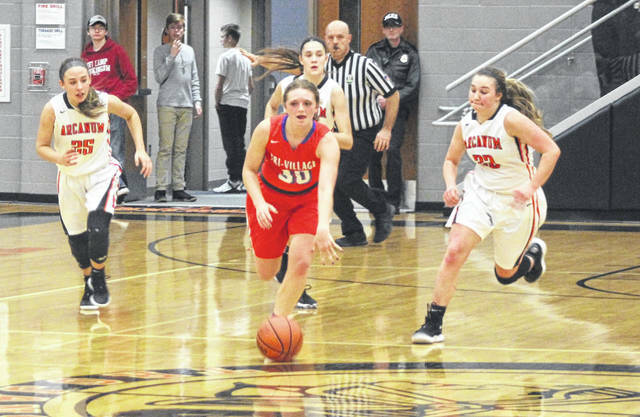 Despite Arcanum’s will and determination in making Tri-Village earn every point, it was the Patriots who prevailed 57-45 to close out league play at 12-0. “It was a nice win tonight,” TVHS coach Brad Gray said. “I give Arcanum all kinds of credit. They really battled us and made this a difficult win. The final score really doesn’t indicate how tough this game really was, but to our kids’ credit I thought we battled some adversity with foul trouble early with both our bigs and having to sit both of them a good portion of the first half. Obviously that took a toll on us, but it helped that we were able to keep them both on the floor for the whole second half. 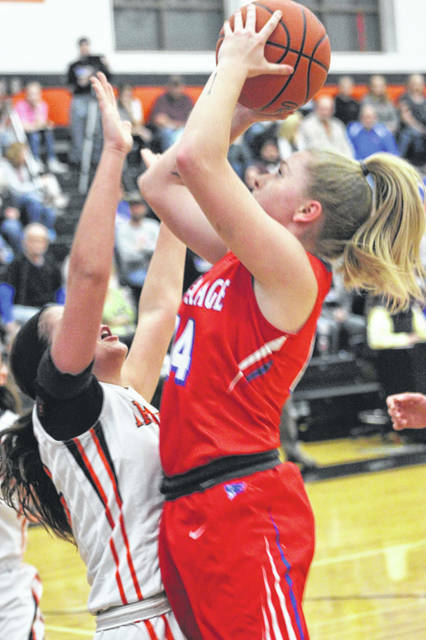 Tri-Village opened the game on fire offensively jumping out to a 16-5 lead before Arcanum rallied for a 7-2 run in the final minute-plus of the quarter to make the score 18-12 after the first eight minutes of the game. Senior Emma Printz was a big catalyst for the Lady Patriots in that opening frame as she connected on two 3-pointer and a free throw to score 7 of her 10 total game points. But the scoring went cold in the second quarter. 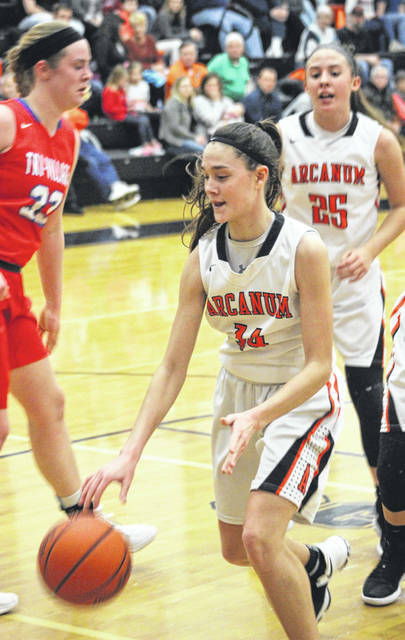 Neither team scored a single point in the first four-plus minutes, but with 3:44 to go before halftime Arcanum freshman Madelyn Fearon got one to fall from behind the arc and that pulled the Trojans to within three at 18-15. Freshman post player Taylor Gray then got a bankshot to fall for Arcanum to cut Tri-Village’s lead to one at 18-17 – the closest they had been since the tip off. A few seconds later Tri-Village’s Maddie Downing mirrored what Gray had just done to stretch her teams’ lead back to three points at 20-17, but Arcanum junior Camille Pohl drove in for a layup about a minute after that to cut the lead to one point again at 20-19. A few seconds later, Printz nailed her third triple of the game for the final points of the half as Tri-Village went into the break with a 23-19 lead. “We made some adjustments in how we come off our transition in the second quarter,” Arcanum coach Michael Dean said. “We went from a different kind of half-court press to where we can feed a little easier to our wings. Our kids stepped it up and we made some shots and I couldn’t be prouder of my kids. They worked hard tonight. They faced a tough team the other night in Versailles and played them strong and then came in here tonight and they did not let up. 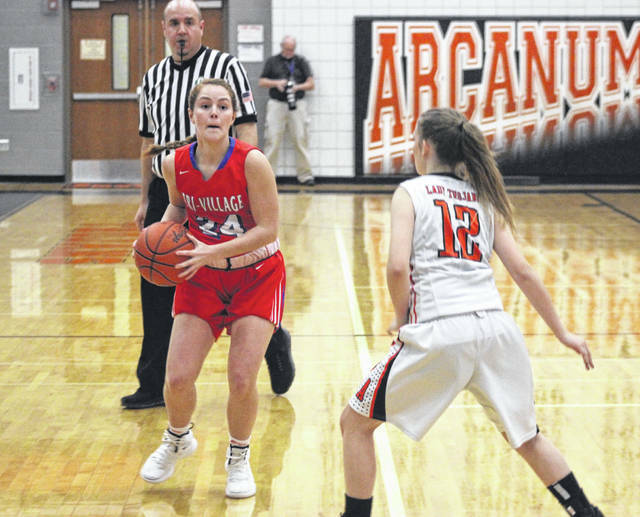 The third quarter began with Arcanum carrying over the momentum it had at the end of the first half with a deuce by Gracie Garno at the 7:35 mark to make it 23-21 in favor of Tri-Village. 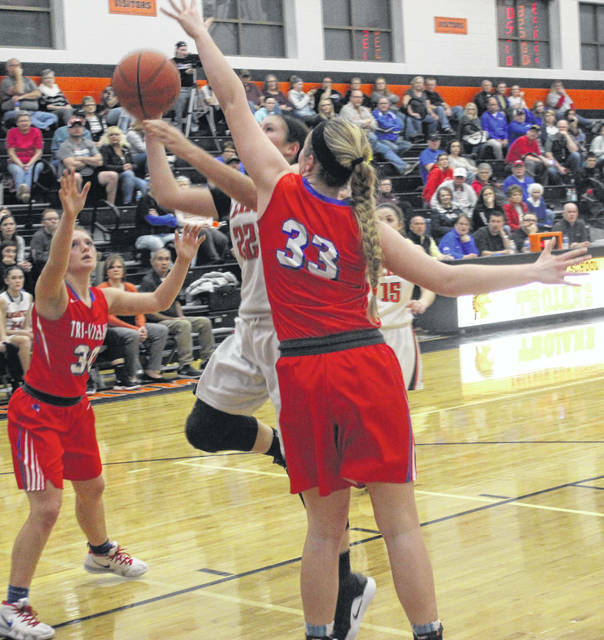 The Lady Patriots answered with a layup by Lissa Siler and the two teams traded buckets again with Kayla O’Daniel connecting for Arcanum followed by a score from Meghan Downing to make it 27-24 TV’s advantage. 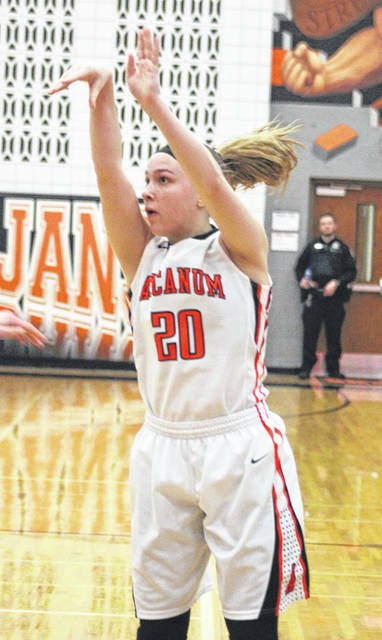 Pohl scored for Arcanum with 4:47 left in the third quarter to get within one again at 27-26, but that would be the last points the Lady Trojans would get until the opening seconds of the fourth quarter as Tri-Village closed out the third frame on a 6-0 run to go up 33-26, its largest lead since the first quarter. “I thought we got away from playing smart basketball in the second quarter,” Gray said. “We were taking too many quick long shots and not getting enough post touches, but we were able to fix that in the second half and to me played pretty smart basketball. After being held to a combined 6 points in the first half, the Downing sisters – Meghan and Maddie – took control of the game by scoring 24 points together in the final two periods. Meghan finished with a game-high 19 points and Maddie had 11. 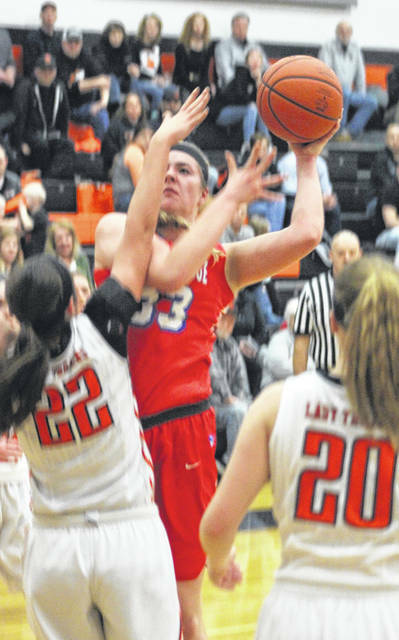 Two other Tri-Village players scored in double figure as well. Printz and Siler each had 10 for the game. 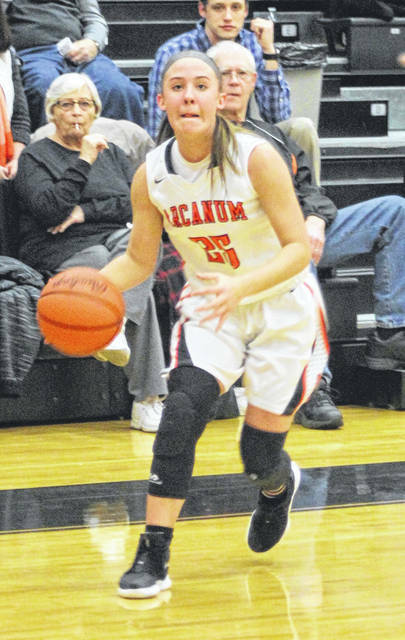 For Arcanum, while they never got as close as one point again, they never were too far out of it until they had to start fouling in the final two minutes. 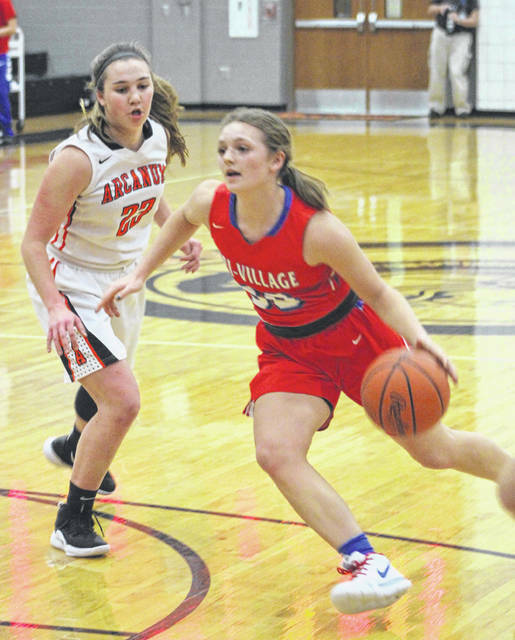 From the 1:10 mark of the fourth quarter, Tri-Village scored 11 points including going 8-for-12 at the free throw line while the Trojans were only able to notch 6 points. The Trojans were led by Fearon with 10 points. Garno had 9 followed by O’Daniel with 8 and Pohl with 7. “To me I thought we were in it the whole time up until that last minute or so,” Dean said. “I think that is when we had no choice but to start fouling and you know that’s how those games go unfortunately. They have two big kids there with the Downing sisters who are great athletes. In that second half they outrebounded us and got the fouls they needed from us to get to the line. It was also Senior Night for the Trojans, who recognized three seniors – Sasha Derringer, Mady Richards and Macey Hartman. Tri-Village has two regular season games left on its schedule beginning with a trip to Fort Recovery on Saturday. Arcanum opens tournament action against Jamestown Greeneview with a 6 p.m. tip off on Feb. 13 at Covington. Tri-Village – Emma Printz 3 1 10, Meghan Downing 7 5 19, Peyton Bietry 1 0 2, Andi Bietry 0 5 5, Lissa Siler 3 3 10, Maddie Downing 5 1 11. Totals: 19 15 57. Arcanum – Gracie Garno 3 1 9, Camille Pohl 3 1 7, Madelyn Fearon 4 0 10, Hailey Unger 1 1 3, Kayla O’Daniel 3 1 8, Taylor Gray 1 0 2, Elliana Sloan 2 0 6. Totals: 17 4 45. Records: Tri-Village (19-1, 12-0 CCC), Arcanum (14-8, 8-4 CCC).